These highlights do not include all the information needed to use Adacel safely and effectively. See full prescribing information for Adacel. For routine booster vaccination, a first dose of Adacel is administered 5 years or more after the last dose of Diphtheria and Tetanus Toxoids and Acellular Pertussis (DTaP) series or 5 years or more after vaccination with Tetanus and Diphtheria Toxoids Adsorbed (Td). A second dose of Adacel may be administered 8 years or more after the first dose with Tetanus Toxoid, Reduced Diphtheria Toxoid and Acellular Pertussis Vaccine Adsorbed (Tdap). To report SUSPECTED ADVERSE REACTIONS, contact Pharmacovigilance Department, Sanofi Pasteur Inc., Discovery Drive, Swiftwater, PA 18370 at 1-800-822-2463 (1-800-VACCINE) or VAERS at 1-800-822-7967 or http://vaers.hhs.gov. Do not mix Adacel with any other vaccine in the same syringe or vial. Adacel® is a vaccine indicated for active booster immunization against tetanus, diphtheria and pertussis. Adacel is approved for use in individuals 10 through 64 years of age. Just before use, shake the vial or syringe well until a uniform, white, cloudy suspension results. Parenteral drug products should be inspected visually for particulate matter and discoloration prior to administration, whenever solution and container permit. If either of these conditions exist, the vaccine should not be administered. Adacel should not be combined through reconstitution or mixed with any other vaccine. Discard unused portion in vial. Adacel is administered as a single 0.5 mL intramuscular injection. A first dose of Adacel is administered 5 years or more after the last dose of the Diphtheria and Tetanus Toxoids and Acellular Pertussis (DTaP) series or 5 years or more after a dose of Tetanus and Diphtheria Toxoids Adsorbed (Td). A second dose of Adacel may be administered 8 years or more after the first dose of Tetanus Toxoid, Reduced Diphtheria Toxoid and Acellular Pertussis Vaccine Adsorbed (Tdap). Adacel may be administered for tetanus prophylaxis for wound management. 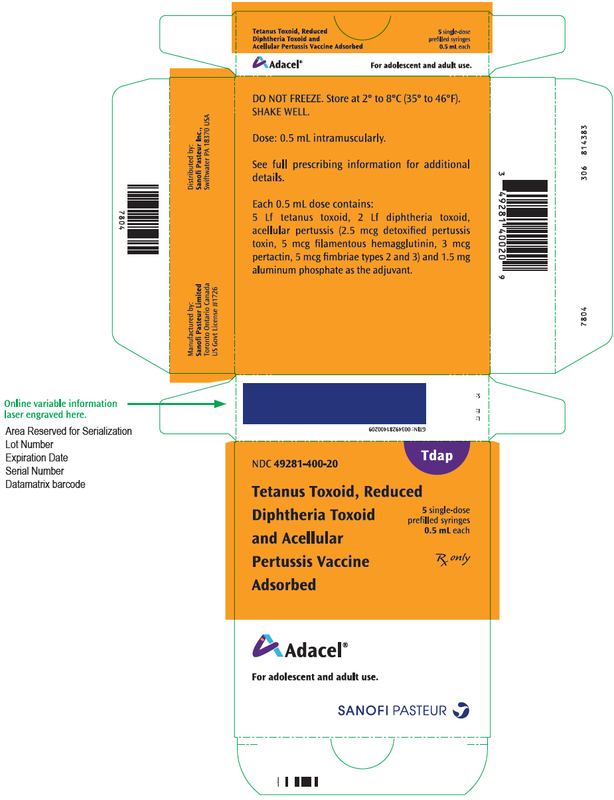 For management of a tetanus prone wound, a booster dose of Adacel may be administered if at least 5 years have elapsed since previous receipt of a tetanus toxoid containing vaccine. A severe allergic reaction (eg, anaphylaxis) after a previous dose of any tetanus toxoid, diphtheria toxoid or pertussis containing vaccine or any other component of this vaccine is a contraindication to administration of Adacel. [See DESCRIPTION (11).] Because of uncertainty as to which component of the vaccine may be responsible, none of the components should be administered. Alternatively, such individuals may be referred to an allergist for evaluation if further immunizations are to be considered. Encephalopathy (eg, coma, prolonged seizures, or decreased level of consciousness) within 7 days of a previous dose of a pertussis containing vaccine not attributable to another identifiable cause is a contraindication to administration of any pertussis containing vaccine, including Adacel. A review by the Institute of Medicine found evidence for acceptance of a causal relation between tetanus toxoid and both brachial neuritis and Guillain-Barré syndrome. (1) If Guillain-Barré syndrome occurred within 6 weeks of receipt of prior vaccine containing tetanus toxoid, the risk for Guillain-Barré syndrome may be increased following a dose of Adacel. Syncope (fainting) can occur in association with administration of injectable vaccine, including Adacel. Procedures should be in place to prevent falling injury and manage syncopal reactions. Because clinical trials are conducted under widely varying conditions, adverse reaction rates observed in the clinical trials of a vaccine cannot be directly compared to rates in the clinical trials of another vaccine and may not reflect the rates observed in practice. The adverse reaction information from clinical trials does, however, provide a basis for identifying the adverse events that appear to be related to vaccine use and for approximating rates of those events. As with any vaccine, there is the possibility that broad use of Adacel could reveal adverse reactions not observed in clinical trials. The safety of a first vaccination with Adacel was evaluated in 5 clinical studies. Three of the studies were conducted in the U.S. and 2 were conducted in Canada. Of the study participants, 86% were Caucasian, 8% Black, 3% Hispanic, 1% Asian and 2% of other ethnic origin. A total of 7,143 individuals 10 through 64 years of age inclusive (4,695 adolescents 10 through 17 years of age and 2,448 adults 18 through 64 years of age) received a single dose of Adacel. Clinical study Td506 was a randomized, observer-blind, active-controlled trial that enrolled adolescents 11 through 17 years of age (Adacel N = 1,184; DECAVAC (Tetanus and Diphtheria Toxoids Adsorbed; manufactured by Sanofi Pasteur Inc., Swiftwater, PA) N = 792) and adults 18 through 64 years of age (Adacel N = 1,752; DECAVAC N = 573). Study participants had not received tetanus or diphtheria-containing vaccines within the previous 5 years. Solicited local and systemic reactions and unsolicited adverse events were monitored daily for 14 days post vaccination using a diary card. From days 14 to 28 post vaccination, information on adverse events necessitating a medical contact, such as a telephone call, visit to an emergency room, physician's office or hospitalization, was obtained via telephone interview or at an interim clinic visit. From days 28 to 6 months post vaccination, participants were monitored for unexpected visits to a physician's office or to an emergency room, onset of serious illness, and hospitalizations. Information regarding adverse events that occurred in the 6-month post vaccination time period was obtained from participants via telephone contact. At least 96% of participants completed the 6-month follow-up evaluation. The frequency of selected solicited adverse reactions (erythema, swelling, pain and fever) occurring during days 0 to 14 following vaccination with Adacel or Td vaccine in adolescents 11 through 17 years of age and adults 18 through 64 years of age are presented in Table 1. Most of these reactions were reported at a similar frequency in recipients of both Adacel and Td vaccine. Pain at the injection site was the most common adverse reaction in 62.9% to 77.8% of all vaccinees. In addition, overall rates of pain were higher in adolescent recipients of Adacel compared to Td vaccine recipients. Rates of moderate and severe pain in adolescents did not significantly differ between the Adacel and Td vaccine groups. Among adults, the rates of pain after receipt of Adacel or Td vaccine did not significantly differ. Fever of 38°C and higher was uncommon, although in the adolescent age group it occurred significantly more frequently in Adacel recipients than Td vaccine recipients. The study sample size was designed to detect >10% differences between Adacel and Td vaccines for events of 'Any' intensity. N = number of participants with available data. 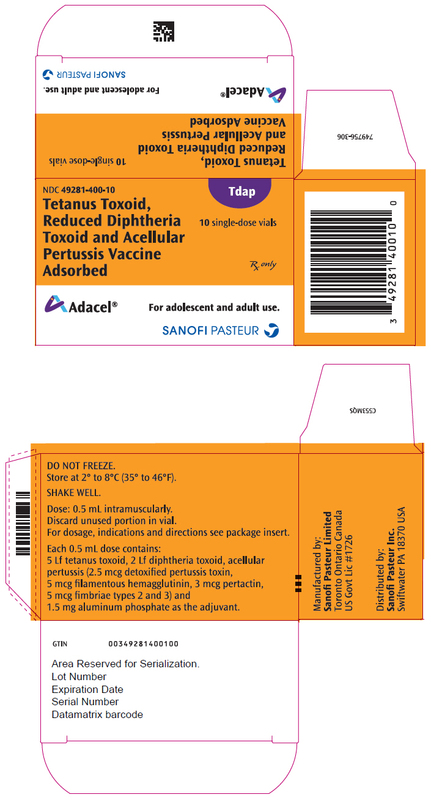 Tetanus and Diphtheria Toxoids Adsorbed manufactured by Sanofi Pasteur Inc., Swiftwater, PA.
Adacel did not meet the non-inferiority criterion for rates of 'Any' Pain in adolescents compared to Td vaccine rates (upper limit of the 95% CI on the difference for Adacel minus Td vaccine was 10.7% whereas the criterion was <10%). For 'Any' Fever the non-inferiority criteria was met, however, 'Any' Fever was statistically higher in adolescents receiving Adacel. Interfered with activities, but did not necessitate medical care or absenteeism. Incapacitating, prevented the performance of usual activities, may have/or did necessitate medical care or absenteeism. The frequency of other solicited adverse reactions (days 0-14) are presented in Table 2. The rates of these reactions following a first vaccination with Adacel were comparable with those observed with Td vaccine. Headache was the most frequent systemic reaction and was usually of mild to moderate intensity. Injection site and systemic solicited reactions occurred at similar rates in Adacel and Td vaccine recipients in the 3 day post-vaccination period. Most injection site reactions occurred within the first 3 days after vaccination (with a mean duration of less than 3 days). The rates of unsolicited adverse events reported from days 14-28 post-vaccination were comparable between the two vaccine groups, as were the rates of unsolicited adverse events from day 28 through 6 months. There were no spontaneous reports of extensive limb swelling of the injected limb in study Td506, nor in the other three studies which also contributed to the safety database for Adacel. In a randomized, observer-blind, active-controlled, multi-center study (Td537), adults 18 through 64 years of age who had received a first dose of Adacel 8-12 years previously were enrolled and randomized to receive either Adacel (N = 1002) or a US licensed Td vaccine, TENIVAC (Tetanus and Diphtheria Toxoids Adsorbed; manufactured by Sanofi Pasteur, Limited) (N = 328). Subjects were recruited from the primary licensure study Td506 and the Canadian general public and had not received Td or Tdap vaccine since their initial Adacel dose. The demographic characteristics for study participants were similar for both vaccine groups. The mean ages were 28.9 years for the Adacel group and 29.2 years for the Td group. Overall, there were more female participants in both the Adacel group and Td group; 64.5% and 64.6%, respectively. In both vaccine groups, greater than 94% of subjects identified as white and 99% as non-Hispanic or Latino. Safety data were collected from all participants who received the study vaccine (N = 999 for the Adacel group; N = 328 for the Td group). Solicited local and systemic reactions and unsolicited adverse events were monitored for 7 days post-vaccination using a diary card. Unsolicited adverse events were collected for approximately 28 days post-vaccination. Serious adverse events were collected throughout the study period (up to 6 months post-vaccination). Solicited adverse reactions reported to occur during days 0-7 following vaccination are presented in Table 3. 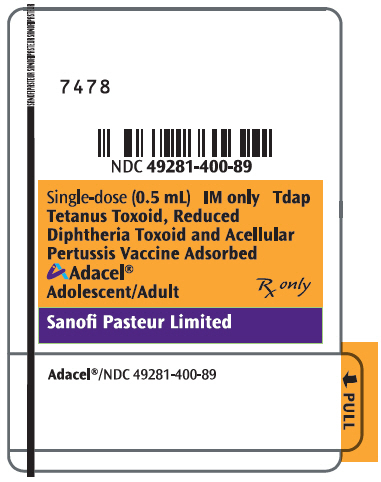 Tetanus and Diphtheria Toxoids Adsorbed manufactured by Sanofi Pasteur Limited, Toronto, Ontario, Canada. Study Td518 was a descriptive, open-label, post-marketing, multi-center study evaluating the safety of Adacel readministration in adults 5 years following a previous dose of Adacel. The mean age of subjects was 31.7 years, there were more females (52.2%) than males (47.8%) and 89.9% of subjects were Caucasian. Solicited adverse reactions were collected for 14 days following vaccination. SAEs were monitored for 6 months following vaccination. A total of 545 subjects 16-69 years of age were enrolled. All participants in this study received a first dose of Adacel vaccine as part of Sanofi Pasteur studies Td501, Td502, or Td505. Approximately 90% of the participants had at least one solicited injection site reaction. The most frequently reported injection site reactions were pain in 87.6% of subjects, followed by erythema/redness in 28.6%, and swelling in 25.6%. Approximately 77% of the participants had at least one solicited systemic reaction. The most frequently reported solicited systemic adverse reactions in subjects who received a second dose of Adacel were myalgia (61%), followed by headache (53.2%), malaise (38.2%), and fever (6.5%). In the concomitant vaccination study with Adacel (first vaccination) and Hepatitis B vaccine [Recombivax HB] (Td501) [See CLINICAL STUDIES (14)], injection site and systemic adverse events were monitored daily for 14 days post-vaccination using a diary card. Injection site adverse events were only monitored at site/arm of Adacel administration. Unsolicited reactions (including immediate reactions, serious adverse events and events that elicited seeking medical attention) were collected at a clinic visit or via telephone interview for the duration of the trial, ie, up to 6 months post-vaccination. The rates reported for fever and injection site pain (at the Adacel administration site) were similar when Adacel and Hepatitis B vaccine were given concurrently or separately. However, the rates of injection site erythema (23.4% for concomitant vaccination and 21.4% for separate administration) and swelling (23.9% for concomitant vaccination and 17.9% for separate administration) at the Adacel administration site were increased when coadministered. Swollen and/or sore joints were reported by 22.5% for concomitant vaccination and 17.9% for separate administration. The rates of generalized body aches in the individuals who reported swollen and/or sore joints were 86.7% for concomitant vaccination and 72.2% for separate administration. Most joint complaints were mild in intensity with a mean duration of 1.8 days. The incidence of other solicited and unsolicited adverse events were not different between the 2 study groups. In the concomitant vaccination study with Adacel (first vaccination) and trivalent inactivated influenza vaccine [Fluzone] (Td502) [See CLINICAL STUDIES (14)], injection site and systemic adverse events were monitored for 14 days post-vaccination using a diary card. All unsolicited reactions occurring through day 14 were collected. From day 14 to the end of the trial, ie, up to 84 days, only events that elicited seeking medical attention were collected. The rates of fever and injection site erythema and swelling were similar for recipients of concurrent and separate administration of Adacel and TIV. However, pain at the Adacel injection site occurred at statistically higher rates following concurrent administration (66.6%) versus separate administration (60.8%). The rates of sore and/or swollen joints were 13% for concurrent administration and 9% for separate administration. Most joint complaints were mild in intensity with a mean duration of 2.0 days. The incidence of other solicited and unsolicited adverse events was similar between the 2 study groups. In an additional study (Td505), 1,806 adolescents 11 through 17 years of age received Adacel (first vaccination) as part of the lot consistency study used to support Adacel licensure. This study was a randomized, double-blind, multi-center trial designed to assess lot consistency as measured by the safety and immunogenicity of 3 lots of Adacel when given as a booster dose to adolescents 11 through 17 years of age inclusive. Local and systemic adverse events were monitored for 14 days post-vaccination using a diary card. Unsolicited adverse events and serious adverse events were collected for 28 days post-vaccination. Pain was the most frequently reported local adverse event occurring in approximately 80% of all participants. Headache was the most frequently reported systemic event occurring in approximately 44% of all participants. Sore and/or swollen joints were reported by approximately 14% of participants. Most joint complaints were mild in intensity with a mean duration of 2.0 days. An additional 962 adolescents and adults received Adacel in three supportive Canadian studies (TC9704, Td9707 and TD9805) used as the basis for licensure in other countries. Within these clinical trials, the rates of local and systemic reactions following the first vaccination with Adacel were similar to those reported in the four principal trials in the U.S. with the exception of a higher rate (86%) of adults experiencing "any" local injection site pain. The rate of severe pain (0.8%), however, was comparable to the rates reported in four principal trials conducted in the US. There was one spontaneous report of whole-arm swelling of the injected limb among the 277 Td vaccine recipients, and two spontaneous reports among the 962 Adacel recipients in the supportive Canadian studies. An additional study (Td519) enrolled 1,302 individuals in an open label, two-arm, multicenter trial (651 participants in each group) to evaluate the safety and immunogenicity of a first vaccination with Adacel administered to persons 10 to <11 years of age compared to persons 11 to <12 years of age. Immediate reactions were monitored for 20 minutes post-vaccination. Solicited local and systemic adverse events were monitored for 7 days post-vaccination using a diary card. Unsolicited and serious adverse events were collected for approximately 30 days post-vaccination. Similar rates of immediate, solicited and unsolicited adverse reactions were reported in each of the two age cohorts. One serious adverse event, not related to vaccination, was reported in the younger age group. Throughout the 6-month follow-up period following a first vaccination with Adacel in study Td506, SAEs were reported in 1.5% of Adacel recipients and in 1.4% of Td vaccine recipients. Two SAEs in adults were neuropathic events that occurred within 28 days of Adacel administration; one severe migraine with unilateral facial paralysis and one diagnosis of nerve compression in neck and left arm. Similar or lower rates of serious adverse events were reported in the other trials following a first vaccination with Adacel in participants up to 64 years of age and no additional neuropathic events were reported. In study Td537 when a second vaccination of Adacel was administered 8-12 years following the initial vaccination of Adacel, a total of 8 participants (0.8%) in the Adacel group and 1 participant (0.3%) in the Td group reported SAEs during the 6-month follow-up period. All SAEs were considered by the investigator to be unrelated to the study vaccine. In study Td518, seven participants experienced an SAE, all of which were considered by the investigator to be unrelated to the study vaccine. The following adverse events of Adacel have been spontaneously reported in the US and other countries. Because these events are reported voluntarily from a population of uncertain size, it may not be possible to reliably estimate their frequency or establish a causal relationship to vaccine exposure. The following adverse events were included based on one or more of the following factors: severity, frequency of reporting, or strength of evidence for a causal relationship to Adacel. When Adacel is administered concomitantly with other injectable vaccines or Tetanus Immune Globulin, they should be given with separate syringes and at different injection sites. Adacel should not be mixed with any other vaccine in the same syringe or vial. No interference in tetanus and diphtheria seroprotection rates and responses to influenza vaccine, detoxified pertussis toxin (PT), fimbriae types 2 and 3 (FIM) or filamentous hemagglutinin (FHA) were observed when Adacel vaccine was administered concomitantly with TIV compared to separate administration. A lower pertactin (PRN) GMC was observed when Adacel was administered concomitantly with TIV compared to separate administration. There is a pregnancy exposure registry that monitors pregnancy outcomes in women exposed to Adacel during pregnancy. Women who receive Adacel during pregnancy are encouraged to contact directly, or have their healthcare professional contact, Sanofi Pasteur Inc. at 1-800-822-2463 (1-800-VACCINE). All pregnancies have a risk of birth defect, loss or other adverse outcomes. In the US general population, the estimated background risk of major birth defects and miscarriage in clinically recognized pregnancies is 2% to 4% and 15% to 20%, respectively. There are no adequate and well-controlled studies of Adacel administration in pregnant women in the U.S.
An assessment of data from the ongoing pregnancy registry over 12 years (2005-2017) included 1518 reports of exposure to Adacel vaccine from 30 days before or at any time during pregnancy. Of these reports, 543 had known pregnancy outcomes available and were enrolled in the registry prior to the outcomes being known. Among the 543 pregnancies with known outcomes, the timing of Adacel vaccination was not known for 126 of the pregnancies. Of the prospectively followed pregnancies for whom the timing of Adacel vaccination was known, 374 women received Adacel during the 30 days prior to conception through the second trimester. Outcomes among these prospectively followed pregnancies included 5 infants with major birth defects and 25 cases of miscarriage. The effect of Adacel on embryo-fetal and pre-weaning development was evaluated in two developmental toxicity studies in female rabbits. Animals were administered 0.5 mL (a single human dose) of Adacel twice prior to gestation, during the period of organogenesis (gestation day 6) and later during pregnancy on gestation day 29. No adverse effects on pregnancy, parturition, lactation, embryo-fetal or pre-weaning development were observed. There were no vaccine related fetal malformations or other evidence of teratogenesis noted in this study. It is not known whether Adacel vaccine components are excreted in human milk. Data are not available to assess the effect of administration of Adacel on breast-fed infants or on milk production/excretion. The developmental and health benefits of breastfeeding should be considered along with the mother's clinical need for Adacel and any potential adverse effects on the breastfed child from Adacel or from the underlying maternal condition. For preventive vaccines, the underlying maternal condition is susceptibility to disease prevented by the vaccine. Adacel is not approved for individuals less than 10 years of age. Safety and effectiveness of Adacel in persons less than 10 years of age in the U.S. have not been established. Adacel is not approved for use in individuals 65 years of age and older. Adacel is a sterile isotonic suspension of tetanus and diphtheria toxoids and pertussis antigens adsorbed on aluminum phosphate, for intramuscular injection. Each 0.5 mL dose contains 5 Lf tetanus toxoid (T), 2 Lf diphtheria toxoid (d), and acellular pertussis antigens [2.5 mcg detoxified pertussis toxin (PT), 5 mcg filamentous hemagglutinin (FHA), 3 mcg pertactin (PRN), 5 mcg fimbriae types 2 and 3 (FIM)]. Other ingredients per 0.5 mL dose include 1.5 mg aluminum phosphate (0.33 mg aluminum) as the adjuvant, ≤5 mcg residual formaldehyde, <50 ng residual glutaraldehyde and 3.3 mg (0.6% v/v) 2-phenoxyethanol (not as a preservative). The antigens are the same as those in DAPTACEL; however, Adacel is formulated with reduced quantities of diphtheria and detoxified PT. The acellular pertussis vaccine components are produced from Bordetella pertussis cultures grown in Stainer-Scholte medium (2) modified by the addition of casamino acids and dimethyl-beta-cyclodextrin. PT, FHA and PRN are isolated separately from the supernatant culture medium. FIM are extracted and copurified from the bacterial cells. The pertussis antigens are purified by sequential filtration, salt-precipitation, ultrafiltration and chromatography. PT is detoxified with glutaraldehyde, FHA is treated with formaldehyde, and the residual aldehydes are removed by ultrafiltration. The individual antigens are adsorbed onto aluminum phosphate. The tetanus toxin is produced from Clostridium tetani grown in modified Mueller-Miller casamino acid medium without beef heart infusion. (3) Tetanus toxin is detoxified with formaldehyde and purified by ammonium sulfate fractionation and diafiltration. Corynebacterium diphtheriae is grown in modified Mueller's growth medium. (4) After purification by ammonium sulfate fractionation, diphtheria toxin is detoxified with formaldehyde and diafiltered. The adsorbed diphtheria, tetanus and acellular pertussis components are combined with aluminum phosphate (as adjuvant), 2-phenoxyethanol (not as a preservative) and water for injection. Adacel does not contain a preservative. Adacel has not been evaluated for carcinogenic or mutagenic potential, or impairment of male fertility. The effectiveness of the tetanus toxoid and diphtheria toxoid used in Adacel was based on the immune response to these antigens compared to a US licensed Tetanus and Diphtheria Toxoids Adsorbed For Adult Use (Td) vaccine manufactured by Sanofi Pasteur Inc., Swiftwater, PA. The primary measures for immune response to the diphtheria and tetanus toxoids were the percentage of participants attaining an antibody level of at least 0.1 IU/mL. In addition, the ability of Adacel to elicit a booster response (defined as rise in antibody concentration after vaccination) to the tetanus, diphtheria and pertussis antigens following vaccination was evaluated. N = number of participants in the per-protocol population with available data. Booster response is defined as: A 4-fold rise in antibody concentration, if the pre-vaccination concentration was equal to or below the cut-off value and a 2-fold rise in antibody concentration if the pre-vaccination concentration was above the cut-off value. The cut-off value for tetanus was 2.7 IU/mL. Seroprotection rates at ≥0.10 IU/mL and booster response rates to Adacel were non-inferior to Td vaccine (upper limit of the 95% CI on the difference for Td vaccine minus Adacel <10%). Seroprotection rates at ≥1.0 IU/mL were not prospectively defined as a primary endpoint. Booster response is defined as: A 4-fold rise in antibody concentration, if the pre-vaccination concentration was equal to or below the cut-off value and a 2-fold rise in antibody concentration if the pre-vaccination concentration was above the cut-off value. The cut-off value for diphtheria was 2.56 IU/mL. Antibody GMCs, measured in arbitrary ELISA units were calculated separately for infants, adolescents and adults. N = 524 to 526, number of adolescents in the per-protocol population with available data for Adacel. N = 80, number of infants who received DAPTACEL with available data post dose 3 (Sweden Efficacy I). N = 741, number of adults in the per-protocol population with available data for Adacel. GMC following Adacel was non-inferior to GMC following DAPTACEL (lower limit of 95% CI on the ratio of GMC for Adacel divided by DAPTACEL >0.67). The acceptable response rate for each antigen was defined as the lower limit of the 95% CI for the rate being no more than 10% lower than the response rate observed in previous clinical trials. A booster response for each antigen was defined as a 4-fold rise in antibody concentration if the pre-vaccination concentration was equal to or below the cut-off value and a 2-fold rise in antibody concentration if the pre-vaccination concentration was above the cut-off value. The cut-off values for pertussis antigens were established based on antibody data from both adolescents and adults in previous clinical trials. The cut-off values were 85 EU/mL for PT, 170 EU/mL for FHA, 115 EU/mL for PRN and 285 EU/mL for FIM. Study Td519 assessed the comparative immunogenicity of a first vaccination with Adacel administered to adolescents (10 to <11 years of age and 11 to <12 years of age) [See ADVERSE REACTIONS (6.1).] In this study non-inferiority was demonstrated for booster responses to tetanus and diphtheria toxoids, GMCs to the pertussis antigens (PT, FHA, PRN and FIM) and booster responses to the pertussis antigens PT, FHA and PRN. For FIM, non-inferiority was not demonstrated as the lower bound of the 95% CI of the difference in booster response rates (-5.96%) did not meet the predefined criterion (>-5% when the booster response in the older age group was >95%). In study Td537 [See ADVERSE REACTIONS (6.1). ], subjects 18 to 64 years of age who had received a dose of Adacel 8-12 years previously, were randomized to receive a second dose of Adacel or Td vaccine (Tetanus and Diphtheria Toxoids Adsorbed manufactured by Sanofi Pasteur, Limited). Blood samples for immunogenicity analyses were obtained from participants pre-vaccination and approximately 28 days post-vaccination. The per-protocol analysis set was used for all immunogenicity analyses, and included 948 participants in the Adacel group and 317 participants in the Td control vaccine group. Of the study participants, 35% were male. Of subjects who reported a racial/ethnic demographic, 95% were Caucasian, 2% Black, 0.5% American Indian or Alaska native, 1% Asian and 1.5% were of mixed or other origin. A tetanus antitoxoid level of ≥ 0.1 IU/mL, measured by the ELISA used in this study was considered protective. An anti-diphtheria anti-toxin level of ≥ 0.1 IU/mL was considered protective. Pre-vaccination and post-vaccination seroprotection rates and booster response rates are presented in Table 8. Seroprotection rates at ≥0.10 IU/mL for Adacel were non-inferior to Td for diphtheria toxin and tetanus toxoid (upper limit of the 95% CI on the difference for Td vaccine minus Adacel <10%). Seroprotection rates at ≥1.0 IU/mL were not prospectively defined as a primary or secondary endpoint. Booster response is defined as a minimum rise in antibody concentration from pre to post-vaccination. The minimum rise is at least 2 times if the pre-vaccination concentration is above the cutoff value, or at least 4 times if it is at or below the cutoff value. The cutoff values for to tetanus and diphtheria are 2.7 IU/mL and 2.56 IU/mL, respectively. n/M: defines the number n of participants with booster response / the number M of subjects with available data to evaluate booster response. There were (n/M) 703/944, 257/315, 786/945 and 265/315 for Adacel/Tetanus, Td Adsorbed/Tetanus, Adacel/Diphtheria, and Td Adsorbed/Diphtheria, respectively. Booster response rates for tetanus toxoid in Adacel did not meet the pre-specified non-inferiority criteria. For all pertussis antigens (PT, FHA, PRN and FIM), post-vaccination anti-pertussis GMCs in the Adacel group were non-inferior to GMCs induced by 3 or 4 doses of DAPTACEL in historical studies as are presented in Table 9. DAPTACEL: Historical controls who received DAPTACEL in Sanofi Pasteur studies. PT antibody GMC were compared to GMC following 4 doses of DAPTACEL in M5A10. FHA, PRN and FIM antibody GMCs were compared to GMCs following 3 doses of Daptacel in the Sweden I Efficacy trial. For each pertussis antigen, non-inferiority was demonstrated if the lower limit of the 2-sided 95% CI of the GMC ratio (Adacel divided by the historical control) was > 0.66. Booster response rates for PT and FHA were non-inferior in Adacel participants compared to pre-specified criteria for booster response rates, but non-inferiority was not achieved for PRN and FIM booster response rates (See Table 10). Booster response is defined as a minimum rise in antibody concentration from pre to post-vaccination. The minimum rise is at least 2-fold if the pre-vaccination concentration is above the cutoff value, or at least 4-fold if it is at or below the cutoff value. The cutoff values for Study Td537 for the pertussis antigens are: 93 EU/mL for PT, 170 EU/mL for FHA, 115 EU/mL for PRN, and 285 EU/mL for FIM. Pre-specified criteria for booster response rates were derived from participants 21 to <65 years of age who received Adacel in Study Td506. Non-inferiority in booster response rate for each pertussis antigen was demonstrated if the lower limit of the 2-sided 95% CI of the difference of booster response rates between participants receiving Adacel in Study Td537 and expected booster response rates based on Study Td506 was >-10%. Stratton KR, et al, editors. Adverse events associated with childhood vaccines; evidence bearing on causality. Washington: National Academy Press; 1994. p. 67-117. Stainer DW, et al. A simple chemically defined medium for the production of phase I Bordetella pertussis. J Gen Microbiol 1970;63:211-20. Mueller JH, et al. Variable factors influencing the production of tetanus toxin. J Bacteriol 1954;67(3):271-7. FDA. Department of Health and Human Services (DHHS). Biological products bacterial vaccines and toxoids; implementation of efficacy review; proposed rule. Fed Reg 1985;50(240):51002-117. Wassilak SGF, et al. Tetanus toxoid. In: Plotkin SA, Orenstein WA, Offit PA, editors. Vaccines. 5th ed. Philadelphia, PA: WB Saunders Company; 2008. p. 805-39. Vitek CR and Wharton M. Diphtheria toxoid. In: Plotkin SA, Orenstein WA, Offit PA, editors. Vaccines. 5th ed. Philadelphia, PA: W.B. Saunders Company; 2008. p. 139-56. Gustafsson L, et al. A controlled trial of a two-component acellular, a five-component acellular and a whole-cell pertussis vaccine. N Engl J Med 1996;334(6):349-55. Syringe, without needle, single-dose – NDC 49281-400-89 (not made with natural rubber latex); in package of 5 syringes, NDC 49281-400-20. Syringe, without needle, single-dose – NDC 49281-400-88; in package of 5 syringes, NDC 49281-400-15. The tip caps of the prefilled syringes may contain natural rubber latex. No other components are made with natural rubber latex. Vial, single-dose – NDC 49281-400-58; in package of 5 vials; NDC 49281-400-05. The vial stopper is not made with natural rubber latex. Discard unused portion in vial. Vial, single-dose – NDC 49281-400-58; in package of 10 vials; NDC 49281-400-10. The vial stopper is not made with natural rubber latex. Discard unused portion in vial. Adacel should be stored at 2°C to 8°C (35°F to 46°F). DO NOT FREEZE. Product which has been exposed to freezing should not be used. Do not use after expiration date shown on the label. Before administration of Adacel, healthcare providers should inform the patient, parent or guardian of the benefits and risks of the vaccine and the importance of receiving recommended booster dose unless a contraindication to further immunization exists. The healthcare provider should inform the patient, parent or guardian about the potential for adverse reactions that have been temporally associated with Adacel or other vaccines containing similar components. The healthcare provider should provide the Vaccine Information Statements (VISs) that are required by the National Childhood Vaccine Injury Act of 1986 to be given with each immunization. The patient, parent or guardian should be instructed to report any serious adverse reactions to their healthcare provider. Adacel® is a registered trademark of Sanofi, its affiliates, and its subsidiaries. For adolescent and adult use.